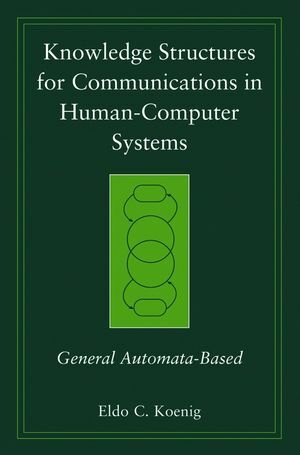 Drawing on author Eldo C. Koenig's extensive expertise and culling from his thirty-four previously published works, this seminal resource presents knowledge structures for communication in Human-Computer Systems (HCS) based on General automata. The resulting model provides knowledge representations for software engineering. Of the many features required for a method to achieve the desired communication in HCS, Knowledge Structures for Communications in Human-Computer Systems identifies six of them in great length-extracting and storing the knowledge of sentences; knowledge association; deductive processes; inferences; feedback; and sequencing of knowledge-along with illustrations for achieving them by the General Automata Method. After presenting the analysis for each feature, the book includes practical applications that illustrate the results. Koenig also describes algorithms and programs that achieve some of the features, and provides readers with additional algorithms and further research. Richly illustrated throughout to elucidate concepts, Knowledge Structures for Communications in Human-Computer Systems is an excellent teaching text suitable for both academic and industrial settings. Eldo C. Koenig began his professional career with the U.S.A. War Department, Manhattan District, in work associated with the atomic bomb. A retired professor of the University of Wisconsin–Madison's computer sciences department, Koenig is an active member of ACM, IEEE Computer Society, and the AAAS. He has published over fifty works pertaining to computers and computing and was the recipient of several prestigious awards, including the Allis-Chalmers Fellowship Award and the Alfred Noble Prize in 1951. 1.1 Considerations for Establishing Knowledge Structures for Computers. 1.2 Knowledge About Automata as a Subset of World Knowledge. 1.2.2 Extracting and Storing the Meanings of Sentences. 1.2.4 Establishing Conclusions and Inferences. 2.1 Formal Analysis for a General Automaton. 2.1.3 Select Properties of the Graph Model. 2.2 An Application of the Disciplines to the Modeling of Natural Automata. 2.2.3 Algorithm for Determining Required State Changes. 3. A General Automaton: Detailed Analysis. 3.1 Distinguishable Receptors and Effectors. 3.4 Nonshared Environments Interpreted as Distinguishable. 3.4.1 Model for Performance in Both Shared and Nonshared Environments. 3.4.2 Model for Performance in Shared Environments. 4. Processing of Knowledge About Automata. 4.1 Formulation of a Language Information Theory. 4.2 Extracting and Storing the Meaning of Sentences by Computer. 4.2.1 Description of an Algorithm. 4.3.1 Association by Combining Graphs Through Common Points. 4.3.2 Associations by Combining Graph (n + 1)-Tuples. 4.3.3 Computer Methods for Association of Knowledge. 4.4.1 Deductive Processes Related to Association Through Common Points. 4.4.2 Deductive Processes Related to Association by Combining Graph Tuples. 4.4.3 Deductive Processes with Aristotelian Form A as a Premise. 4.5.1 Inferences Related to a Single Graph Tuple of Associated Knowledge. 4.5.2 Inferences Related to More than One Graph Tuple of Associated Knowledge. 5. A General System of Interactive Automata. 5.1 Formal Analysis for a General System of Interactive Automata. 5.2.2 A System of Many Components. 6. Processing of Knowledge About Systems of Automata. 6.1 A General System of Interactive Automata: Detailed Analysis. 6.2 Knowledge Structures for Sentences Describing Systems of Interactive Automata. 7. Changing Expressions of Knowledge for Communication from One Form and Style to Another. 7.3 Establishing Open Expressions and Open Sentences. 7.4 Selecting Subsets of Open Expressions. 7.5 Applying the Results of the Above Analysis. 8. Electronic Security Through Pseudo Languages. 8.2 Defi nitions, Sets, and Relations. 8.3 Analysis for E-Security Through Pseudo Languages. 8.3.1 A Basic E-Security System. 8.3.2 A Two-Step Encryption System. Appendix A: Analysis for an Effective Operation of a General Automaton. Appendix B: Analysis for an Effective Operation of a General System of Interactive Automata.